There are abundant LMSs available in the market today making it hard to determine which ones will suit your purposes the best. Many LMSs are quite expensive and their implementation can take a lot of time. A one-size-fits-all solution is not available and you can easily get lost in the marketing hype of large LMSs. Selecting the right LMS is one of the most time consuming and costly decisions for schools or districts who want to expand their technological infrastructures. Using the robust LMS technology, schools can provide an online portal for their classrooms, help educators with administrative tasks and allow students to view learning materials, assignments and grades at one place. Creating online learning will require an LMS for deploying, disseminating and tracking content. Without it, the impact of content on your students and how they’re retaining the information cannot be assessed. 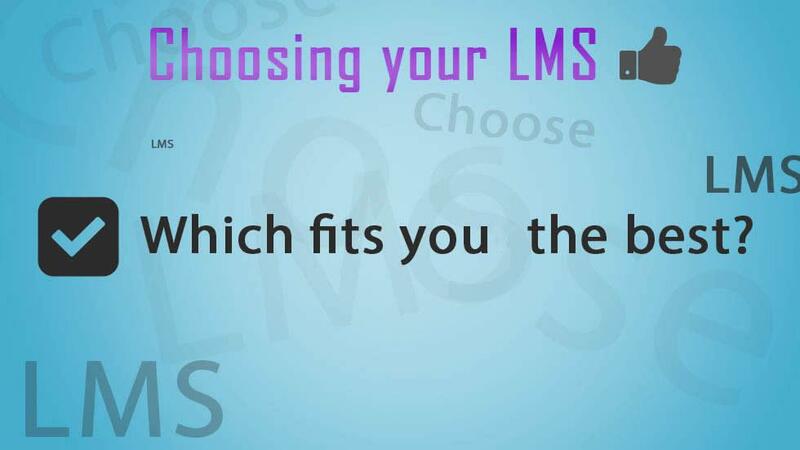 You need an LMS that is comprehensive enough to fit all your needs. Know your audience: While going through the research process to select an LMS, always keep your audience in mind. There are LMS solutions designed for either corporate or academic purposes or for both. If you’re looking for an LMS for teachers, make sure it is a user-friendly system that has the functionality for grading, keeping track of assignments and monitoring student progress. Students like a user-friendly system that allows them to interact with teachers and other students, have all their work at one place and keep track of their own progress. Prepare your budget: Figuring out how much exactly you need to spend on your LMS is difficult and you need to be flexible while fixing a budget for your LMS. You should set your ideal price and the maximum price that you can pay. You should consider whether you will charge your students for courses and the rate of interest you can expect relative to the system’s expense. Prioritize your requirements: There are a great many features available for LMSs to choose from. You should create a list of the features that you consider most important in the system. After deciding on the features and functionality that you’ll need consider other potential requirements. These may include things required for the implementation of the LMS, the support that the vendor provides, third party content and customization. Plan for growth: An LMS gives you the opportunity to increase your audience and the number of learners. You need to choose a solution that can grow with you. Consider if your LMS will have the functionality that will be required in the future as your school grows. Assess if it’s worth investing time and resources in a basic LMS now and how soon you’ll need to upgrade it. It is essential to think about your growth plans as you embark on your search for an LMS. Thomas Cavanagh, the Associate Vice President of Distributed Learning at the University of Central Florida and his team recently underwent an LMS review and selection process including external consultations, vendor demos, comparative feature checklists, pricing, etc. To ensure that your review of the possible LMS platforms doesn’t miss any critical steps, the faculty should be appropriately questioned to find out what they need and what they are likely to need in the future and the vendors should be asked more specific and targeted questions about the product. Cavanagh and his team surveyed faculty at UCF as an early step in the LMS selection process. He recommends asking questions that invite the faculty to evaluate their current LMS and that will help them forecast their potential needs. The faculty should be questioned on; what features they consider most valuable and useful in the current system? You should have the faculty elaborate in detail what abilities they find most useful in a feature. You can add these items to a comprehensive checklist which you can later send to the vendors, what additional features they would like to see in the new system? You should identify the most common and feasible requests from different teachers, what priority would they assign to each feature? Ask the faculty to weigh the features from the list of features provided by you and identify the most crucial ones, and what role do they think social media can play in their courses in the years to come? Ask them to assess how their students are making transition in the ways of communication by using social media and the growing importance of social media in education. Once you know what features your faculty find useful and essential, what additional features they would value, and how they prioritize among those varied features, you can go ahead and ask vendors some specific and targeted questions such as; what differentiates their platform from its competitors? It is not sufficient if the vendor just identifies the key features of the system. You should approach vendors with a detailed checklist of specific functions that each feature should have, ask if the system will be able to integrate the upcoming trends? The system should be able to support trends like badges, competency-based learning and prior learning assessment, what is the platform’s ability to provide data analytics and interventions for at-risk students? How well will it integrate with your student information system or your ERP? Are there rigorous information security protocols in place? How does it handle integrations from third-party tools? Is the system accessible for accommodating students with disabilities? Go in-depth with this question and find out whether the system is certified at a minimum threshold, or whether that accessibility is an ethos that is integrated into the design. What level of training and support is available from the vendor after the initial deployment of the LMS? In addition to these questions, there are various other things that you’ll need to consider, but only you know what’s right for your organization. Make sure to get a demo of the product before purchasing, and check out free trials. Try not to get lost in the marketing hype and make sure you know exactly what you’re getting from the vendor. Share your views on the context in the Comment Box below.